The believer of a lie is also vicariously a lier. you too were in the board of high men while Rajakashe men had been doing it at their all powers. What did you then add to the media ? Or at all did you have any guts to come forward and express your thought freely as you and other men do today. That susiriplala or the others have become vocals today, but where had all they been during the so called properous day of Rajaakshes `? This endless” bond ” saga is initiated by the corrupt Sirasa (Maharaja Organisation );consequently , Derana and the rest of Mahinda’s media men started to follow suit.now Sirasa is up in arms to take revenge from Ranil ;thus, they want to create a notion that public want Ranil to vacate the PM position .Sirasa has had clearly overstepped it’s role as a media institution , Media freedom does not mean a particular media dominating main media stream with manipulated stories thereby persuading the general public to follow their way of thinking. even though Sirasa had helped to get rid of Mafia regime , they have had their own hidden agendas. sajith Premadasa is their man ;hence, they want to create a vacuum within the UNP , so that Sajith will automatically become the leader of the UNP. this is their plan , pay close attention to Sirasa media , you will see what i mean. Sirasa is an unethical media institute literally in all aspect of reporting , who should take the direct responsibility for destroying our younger generations’ values? especially the teen age girls ! when Sirasa does some thing new to increase their ratings , rest of the other dumb media institutes blindly follow them , what an irony ? a whole generation had been destroyed by this filthy institute , please boycott Sirasa like we ignored/disregard Dayan Jayathilake. Exactly Srilal. I cant agree with you more. But I dont think PM needs to resign here. If SP would take over the country will end up in a mess as was the case with MR again. Besides, Sajith has no whatsowever exp else, begging people and puja wewa puja korami – the like his rhetorics. these men have proved to have no backbones in the days of MR abusive adminsitration. Today they all have guts to add their any evasive thoughts. Bond related issues had long been there with high abuses …. Iqbal was treated with impunity sofar. If AM or anyone s should be investigated, we also bring all the high sharks to lanken courts with them being highly alleged to have grabed various events. TOday, former president s Secretary cant even breath in well when CID found out numerous charges against him. All these are direct involvement of MR and his men. If RW to be charged, MR should have been charged long ago for all the HIGH profile money grabs. The believer of a lie is also vicariously a liar. Political leanings of the COPE members is seen in the report. While the UNP lot wanted to safe guard the Governor others wanted to convict him. What can you expect from such a committee. Independent judges in a court of law will not look at this issue looking at party colours but on facts. There is a long way to go for that. It is worth waiting than stuffing the report into the dustbin the way the previous COPE reports have gone. Anyway the report is before the Parliament and it will be debated and a vote taken and if MPs vote on party lines there is a chance that with UNPSs 106 the report could be defeated with 7 MPs abstaining. What is your considered verdict? Is Arjuna Mahendran guilty by intent or default? Did Arjuna Mahendran take over the Central Bank when it was about to hit the bottom or did he drag it to the bottom? Was he a victim of a pernicious system or the driver of the pernicious system? I still beleive AM is teh scapegoat here. Lanken tabloids almost killed him. In srilanka, it is easy to destroy a persons reputation. So was the case with Ranil Wickramasinghe SOMEtimes no reasons. But RW was very tough not fall down by them. Sirasa has always been abusing all sources to go against RW. Their men would be Sajith. That can be the reason DJ to be invited by them again anda again. DJ is the most abusive man in lanken political analysis. He is cornered today, but the man has still been working for a Sajith s rise. Sajith has not the average knowledge in lanken politics than his inherited rhetorics. Lately, we studied that video came to light the manner how he went through. Kehelwatthe, thugs would have been little bit more decent calling, ” only those who worked for my elections” can collect the bread, while others shouldbe away….. what a young political stance ? No means similar to that of RW or any decent men. Now having completed Gammadda, now they have been high men of the country to be in the middle point of the news. All these are for SP politics. This country will not raise the head easily. I think even the Sri lankan professionals as they are living for so long in an corrupt environment what they write is promoting corrupt activities or they have corrupt minds. First politicians could not release one report that everybody who involved in the report writing could agree with. See the demerits in that. Who ever wanted to include his views, even though others did not agree, were not included in the report so that everybody in the readership could read it. The need to cover up is very clear there. COPE is a highly politicised organiation as everybody are polioticians. There are no independant people who could be truasted were not involved. Probably, in Sri lanka, no one can be truasted. Even though AG is there, he will have to be biased as he has to protect his job as well as he had been appointed by politicians or he is answerable to politicians. Ranil wickramsinghe manipulated the UNP group in that COPE – committe more than once and that means he wanted to hide something. Even what Arjun Mahendran said seems not the real truth and it is just a way to escape. for example, why did they decide suddenly to change the CEO to another when the CEO was Arjun Mahendran’s Son in Law. Secondaly, how come Perpetual treasureis got 83% of the Profits while all other primary dealers got only 16% of the profits. The question is whether the govt ever recover that money what they lost? I think that will never happen because Ranil is involved in that. HE already rewarded people involved in it. Finally, you are talking about invesrtigations. govt knew that procedure was wrong and leads to corruption. anyway they did that. D you think politicians should resign too ? Would that ever happen ? The good thing is today current govt has allowed almost any simon to add their thoughts and join the discussion. That has advantages and disadvantage as well. Even Join opposition crooks have now turned out to be heroes. WA Wijewardena was sitting pretty whilst all the nonsense under Cabraal was going on. Why was he so silent then? He also seems to have a big gripe against the monetary board. Perhaps he is upset he did not get a seat on the board? UNP lot wanted to safe guard the Governor ….. The Governor told the 3 man Royal Committe of Lawyers that Ranil told him to do it. For what the 03 Minister’s Ravi, Malik & Kabir) visit to the CB to discuss what and with whom? Ranil has now turned out to be an absolute FRAUD n has betrayed the trust the voter had in him. He not only has ruined the UNP but have destroyed the economy of the country. Is this what he learnt at Harward? No more Mr. Clean. We were misled to believe. Rajapakshe bashing for an excuse is now relegated to HISTORY. Thonda. 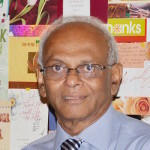 The cheer leader for MR.
Dr W a Wijewardena, Ex Deputy Governor, shirked his responsibility for reasons best known to him inform the public about this blatant robbery of no other institution other than the Central Bank. He, instead tried his best to use the public media to whitewash the whole saga. He deliberately obfuscated the facts which were obvious to any ordinary person. The fact that Mahendran was a foreigner and that the prime minister violated the tenets of the appointment procedure of the governor never brought up by him. He of all people should have pointed out that the whole bond auction was rigged by the governor without refering to the monetory board. He was well awareb that Malik Samarawickrama, Ravi Karunanayake and Raul Hakeem visited the bank and met high officials of monetary board the day before the auction. Mr senanayake , manyy feel, was tacitly supporting this scam out of spite for personal gain. An independent inquiry with legal clout is sure to come and Mr Senanayake will find no hiding place.